Ludwig has updated its 1960s flat-based stands in line with popular retro trends. The Atlas Classic series is practical, stylish and boasts many clever and genuinely useful design details. Flat bases won't be for all. Not cheap. The transition from the 1960s to the 1970s saw a sea change in drum manufacture as drummers demanded much beefier hardware. During the '60s, Ludwig's Flat Based Line stands and Miracle hi-hat were familiar, if less than sturdy. Ludwig gradually toughened things up with its Atlas then Hercules ranges with tripod stands. First seen in 1966, Ludwig's Classic stands had flat legs, while Atlas stands had tripods. The Atlas name was re-introduced in 2012 with three new series - the mid-range Standard, the massive Pro and the flat based Classic, seen here. For review we have a complete set of Classic hardware, although each item is actually sold individually. All the stands are vastly stronger than the 1960s originals and what's more they have an excellent range of features. Legs are quite short, made from flat sections of steel and stiffened by shorter hinged buttress struts. Although designed to lay flat or thereabouts, the legs can also be angled down to form a tripod. And unlike a normal tripod stand the legs fold upwards along the bottom tubing section for convenient packing. Arguments for and against flat-based stands rest on whether they are actually more convenient and aesthetically pleasing than the usual tripod-based fare. Flat bases do give your kit a less cluttered look. But can they ever be as stable and sturdy as a tripod? Well, no. The tripod is a more stable solution and if you are an excessively heavy hitter, flat bases have a greater topple factor. 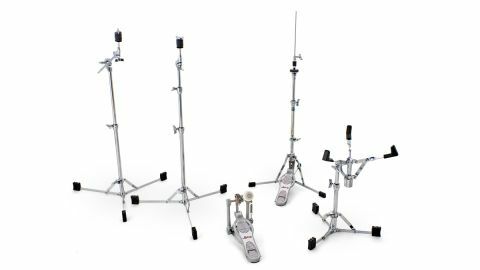 But for the average modern player, who firmly whacks the drums but is no Taylor Hawkins, these flat-based stands should hold up well. "Flat bases do give your kit a less cluttered look and for the average modern player should hold up well." And they have lots of smart features. While the general idea is to splay the legs out horizontally, you can also raise them a few degrees to overlap a neighbouring stand's legs if need be. Additionally, each oblong rubber Acculite Sustain foot (unique to the Classic series) has two leg slots, lower and higher. You can push the leg into either, again giving the option of on-the-floor, or raised up a bit. Which is handy for passing cables beneath too. Both cymbal stands have gearless Aerodyne Tilter Clamps, allowing you infinite scope to position your cymbals at exactly the angles you want. The big wing-screw locks the tilter in a most pleasing and secure, vice-like grip. In fact all the comfortable wing-screws have a reassuringly smooth feel. As for example with the gearless, off-set snare drum cradle. Gearless tilters are essential for snare stands we think. The massive rubber cradling buffers are a bonus too. We've had this bass pedal on our workroom kit for the past couple of weeks and it took no time to get mightily comfortable with it. It's a simple, user-friendly pedal with a silent action. The long elliptical Monarch cam accelerates over the final arc, making it feel faster and yet still direct, particularly with the double chain drive which comes factory-fitted. But there is also included the option to swap for a fabric strap drive and with this you get a bit of a lighter, springier feel, which we rather liked and ended up sticking with. Which leaves us with the hi-hat. Flat-based hi-hats are a worry as the original 1960s one was liable to sway drunkenly under forceful pedalling. Ludwig has taken two big steps to put our minds at ease. First, setting up requires opening out the legs, which pushes the base casting up against the immovable upper tube. This is then locked by the wing-nut hinging into its housing slot. Second, this assembly is then further secured by a giant memory clamp which slips into the housing and is again tightened with a vice-like grip. Thus the base is secured, and proof of the pudding is in the smooth and solid feel of the action once you have adjusted the direct-chain tension to your liking.